From the bus stop/taxi stop of the old wing in 1 Utama, go inside the main doors. C.I Xpress is on your left. 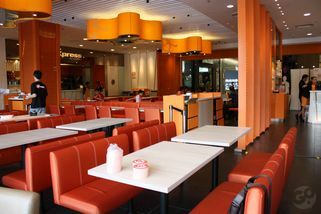 C.I Xpress features a Cantonese "char chan teng" (fast/coffee shop style) type dining experience. 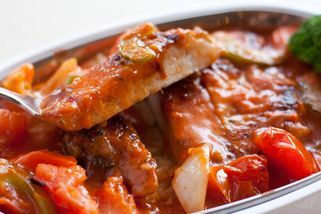 With its wide range of Cantonese cuisine ranging from their signature pork chop rice to personal steamboats, there is a favourite for everyone here. Situated in a clean, cosy and bright environment with comfortable bench seating, C.I Xpress markets itself as an affordable, yet upper-end restaurant. 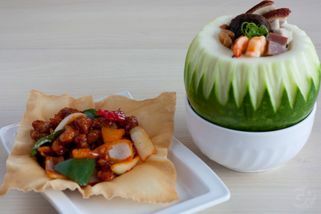 There is traditional Cantonese style food as well as newly invented dishes by the chef featuring a fusion of Western and Asian ingredients. Located in 1 Utama, one of the most frequented and popular shopping malls today, C.I Xpress is easily accessible by car, bus or taxi. In fact, there is a taxi stand right outside the restaurant. This is a great place to have a quick bite as their service is very fast. So, suitable for short lunch meals, etc. There isn't a huge variety on their menu, but I think that's the main reason why they're able to churn out food so quickly. The quality is also pretty great, to be honest! Usually you'd have to substitute speed for quality, but in this case, you have both. Tried their steamed rice with chicken and mushrooms--was quite satisfied with it. Their curry fishball is also pretty good. Will definitely come back! "It's Canton-i but really orange." CI Xpress is located past the escalator from the AEON bakery "La Boheme" and it would have been a bit hard to see (when you're coming from inside 1Utama) if not for its bright orange colour. Did you know C.I stands for Canton-i? As in THE "truly Hong Kong" Canton-i? Yup. If you didn't know, you'd probably guess once you're in. CI Xpress is essentially Canton-i but ...um ...orange - so if you are a fan of Canton-i like I am you won't be disappointed with the food here. I came here with my family for lunch on a Saturday after seeing the gomakan.com Episode 3 video and it was a pretty accurate review. The waitresses at the front door counter were quick to attend to us and directed us to the menu on the wall. 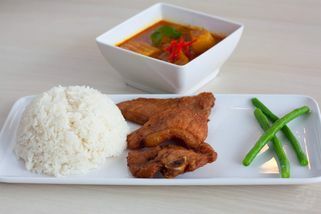 The menu is quite limited and focuses on dishes which can be made fairly quickly. The major difference between the normal Canton-i was that Xpress is intended to be fast-food and adopts a pay-upfront system. Personally, I don't mind either way as long as the food is good. I ordered the mixed meats set which came with a coke for about RM15 which is pretty cheap. It came so fast - not as fast as in the gomakan video but not-enough-time-to-browse-on-your-smartphone kind of "fast". As all parents with toddlers can understand, the longer you wait the more restless your kid becomes, so it was a nice surprise to have a calm and quiet lunch for a change. The taste, quality and freshness was excellent - as is expected from Canton-i. However it just seems weird to me why they didn't just stick with the original Canton-i branding. Honestly, I found the interior off-putting and I just can't rate highly on it - bright "from-concentrate" orange, random veggie prints and a wall-mounted TV are super distracting. What was wrong with the original formula? 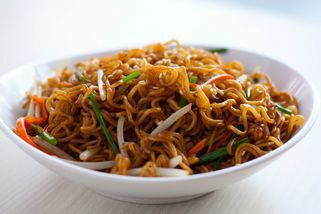 In the end, I would recommend CI Xpress for the delicious food at a great price but I would rather go out of my way to eat at the original Canton-i if given a choice between the two - even if it is more expensive and they charge me RM3 for the wet towel. The dishes are close to Hong Kong style. 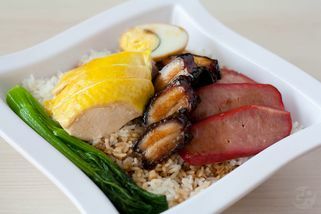 There are some classics here like the pork rice and cheese dish (can't remember what they call it in HK). Noodles and chicken rice was good too. Good value for money because you get a lot of food. Actually I think they should market this towards office workers, because of the volume. This is a good place to go to for lunch in 1U if you feel like chinese food and you don't want to wait. You order at the counter before you sit down (HK style they said).